Emilia Clarke Says the Week After Game of Thrones Ended Was Like Going Through an "Existential Crisis"
Emilia Clarke had a moment when Game of Thrones wrapped filming. Well, more than a moment. Clarke, along with costars Nathalie Emmanuel and Jacob Anderson, was on hand at the Emmys for the HBO fantasy series to take home the Outstanding Drama Series trophy. She said the week after wrapping was more than a strange feeling. "It's bittersweet, we've all done a lot of crying. There's been a lot of crying on set," Clarke said, noting everybody had finished filming on the show. "The week after we finished was a really weird week," Emmanuel said. "Oh my god," Clarke added. "I just felt kind of disjointed and a bit, like, ‘Ohhh,'" Emmanuel said. "Genuine! Existential crisis, like, legit, where you're like, ‘What?'" Clarke said. "What does my life mean without Game of Thrones?" Emmanuel said. Anderson said wrapping made him realize how much he cared about the people who worked on the show. Game of Thrones returned to the Emmys—it wasn't eligible in 2017, but won the top award in 2016—to once again take home the Outstanding Drama Series award, beating out last year's winner The Handmaid's Tale, as well as, The Crown, Stranger Things, Westworld, The Americans and This Is Us. "Every single one of the people up there, accepting that award…we didn't think we were going to get it," Clarke said about the Emmy win. 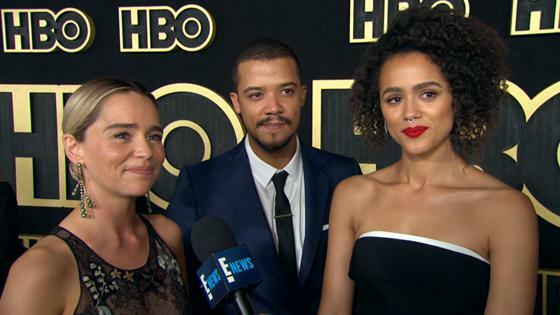 Watch the video above to hear more from the Game of Thrones cast, including their thoughts on the big proposal that happened at the Emmys.